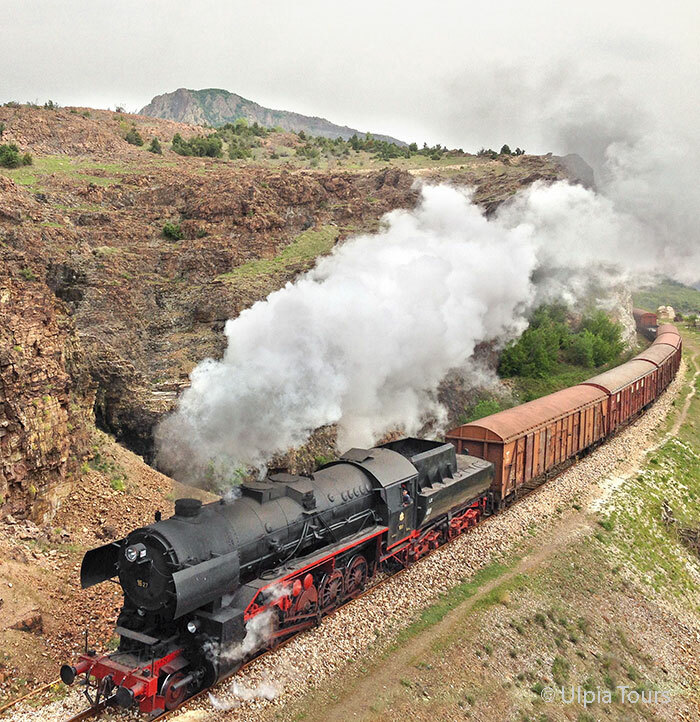 Bulgaria has fantastic landscapes and magnificent steam locomotives. Not long ago they overhauled two big steam locomotives and this made our decision to run a tour under the difficult circumstances much easier. One of these is a locomotive of the larger 2-10-0 German Kriegslok class 42, No.16.27, and the other is the remarkable monster 2-12-4 No.46.03, nicknamed “mother bear”. This is an engine which has no competitor all over Europe, a really impressive locomotive. 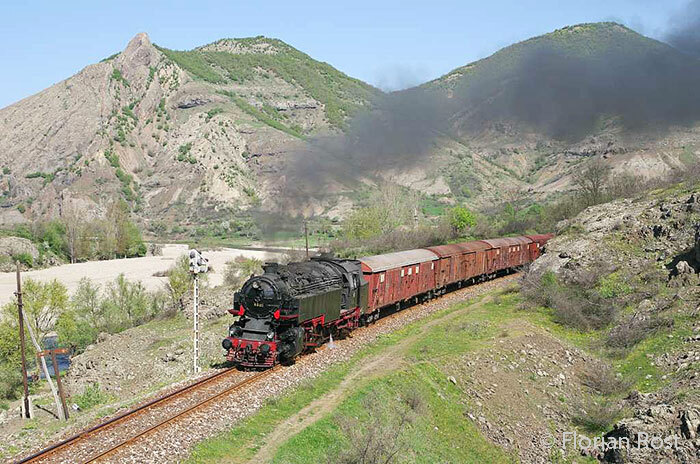 In addition we’ll pay a two day visit to the narrow gauge line from Septemvri to Dobriniste. Currently, we have oral confirmation that they will add an elderly passenger coach to our trains - just as they did in the 1960ies and 70ies. About 9 am we’ll go by charter bus to Lewski (ca. 50 km). In Lewski you’ll find a plinthed 2-8-0 class 17. But far more interesting is our charter train, a freight train, hauled by a class 16. We’ll cover the line Lewski  Oresh  Svishtov (harbour) tender first and will then shunt under the loading cranes of the Danube harbour in Svishtov. In the afternoon we’ll return to Lewski, performing a good number of photo runpasts. In the evening we can do some night shots in the depot. Charter bus back to our hotel in Plewen. In the morning, we’ll go by charter bus to Septemvri (ca. 20 km). Our charter train with 60976 will depart just before sunrise. For the first part of the line we’ll follow the train by bus. In Dolene we’ll go aboard our train. We’ll go as far as Tsvetino and will roll back from there to Velingrad, where our hotel is situated. Arrival in Velingrad about 20.00 hrs. Our charter train will leave Velingrad before sunrise. Between Tsvetino and Avramovo (1,276 m above the sea) a diesel loco will haul our train over the steepest part of the line with serpentine bends and a helical tunnel. Photographically we won’t miss anything in this section, because it leads through deep forests. Beyond Avramovo the line descends for a while. We’ll reach Dobriniste around 19.00 hrs. A charter bus will transfer our group from Dobriniste to Pernik. We’ll reach our hotel in Pernik in the late evening. In the morning we’ll continue from Kjustendil to Gjueshevo. We’ll “celebrate” the sunrise over the sweeping curves beyond Kjustendil. Just keep your fingers crossed that the weather will be on our side. Afterwards the line leads mostly through dense bushes and forests, but the further we approach Gjushevo the more open the countryside becomes. We plan to reach Gjushevo before noon. Our charter bus will bring us to a hotel either in Dragoman or Sofia. 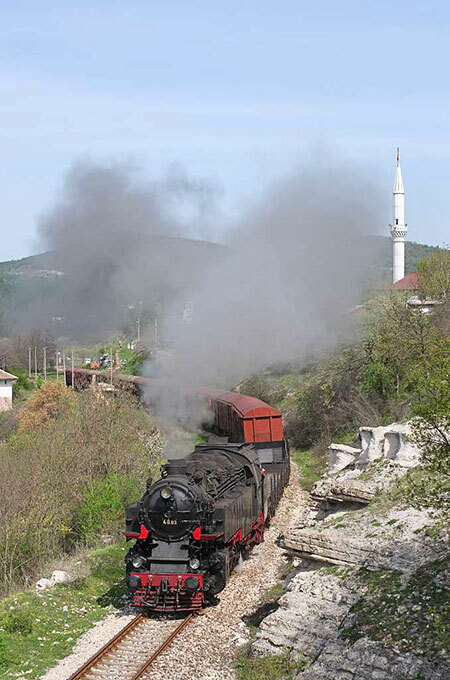 In the early morning, our charter bus will bring us to the industrial line of Kalotina  Stanintzi. A mine in Stanintzi is the reason they built the line through the mountains. Our 2-12-4 will have travelled here overnight and, with a charter freight train, we’ll travel on this continuously graded line. Because there is no chance to turn the locomotive the way downhill will be bunker first. In the evening we’ll return by charter bus to Sofia. Hotel in Sofia. 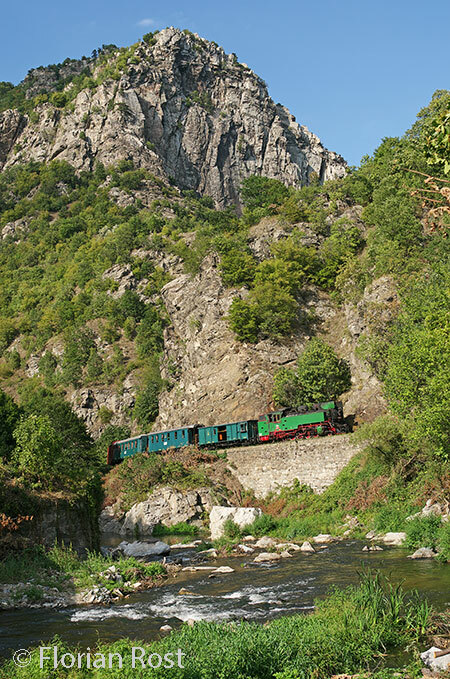 The chosen lines are, with the exception of the narrow gauge line, not the usual lines which almost every charter train tour in Bulgaria covers. Everywhere along our lines, bushes and trees are a problem for photography. That’s why it’s highly recommended you bring a handy saw with you to do the work the track gang should have done! Levski is the starting point of two branch lines; one to the north to Svishtov, a nuclear power plant which will never produce any electricity, and the other to the south to Trojan. The line to Svishtov leads through mainly flat but partly hilly countryside. The highlight of this line is the harbour on the Danube where you can still find loading cranes, something almost extinct at harbours handling containers these days. 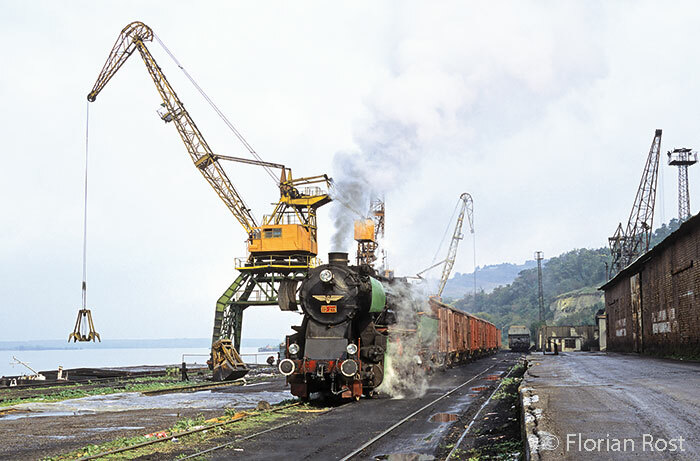 We’ll be able to shunt alongside these cranes and take some pictures from an almost bygone era. Because the authorities refused to turn the loco on the triangle within the nuclear power plant, we’ll go out tender first and return chimney first. On this line we’ll find some pleasant photo opportunities, beyond the usual arch viaduct and gorge photography. The line to the south leads into mountainous terrain, but trees along the line will prevent us from taking pictures at many locations. This beautiful line offers only a limited number of really good photo opportunities, but at sunrise you can take pictures before the line reaches the mountains. Both lines offer photographic opportunities which could be found in the 1980’s, the last years of regular use of steam. We’ll use the 2-10-0 16.27 at the head of a freight train on these lines. South-Eastern Europe used to be covered by extensive 760mm narrow gauge networks. 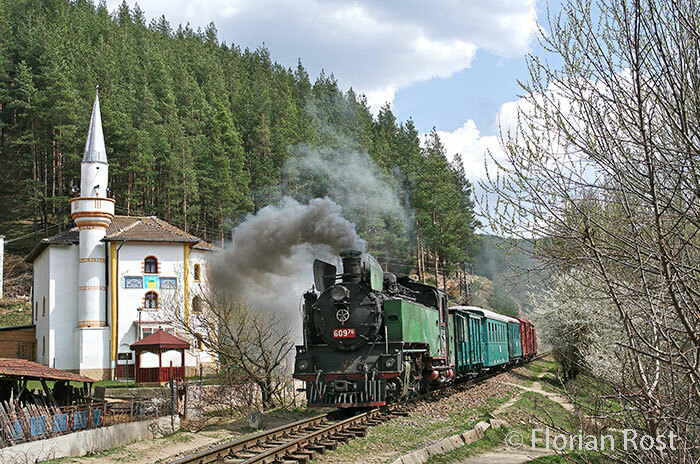 Almost everything of this is history, except the narrow gauge line from Septemvri to Dobriniste, where you can still travel on a long distance narrow gauge railway. 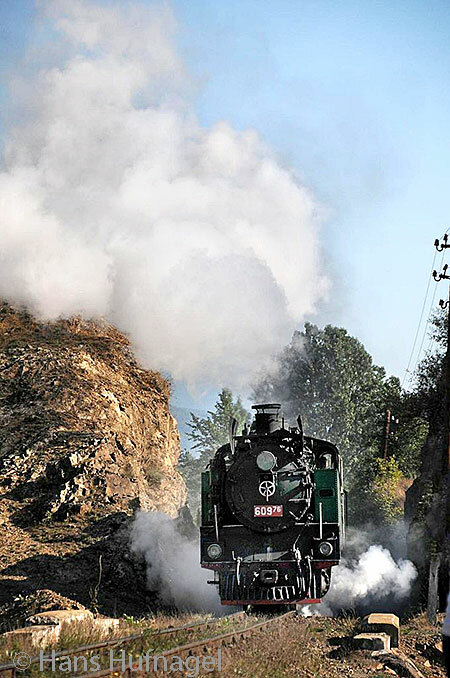 The Rhodope Mountain Railway was built only between 1921 and 1945. It’s operated by the state railway BDŽ. The line is 125km long and has 38 tunnels, terminal loops and gradients of up to 1 in 30 to conquer the altitude difference of more than 1,000 metres. Based on the Saxony VIIK, BMAG (formerly Schwartzkopff) developed a strengthened version with a longer wheelbase for this railway. Only 5 of the 15 locomotives ordered were delivered in 1941, the war hindered further deliveries. The locos were used on the BDŽ-lines Septemvri  Dobroniste and Varvara  Pazardjik sucessfully. 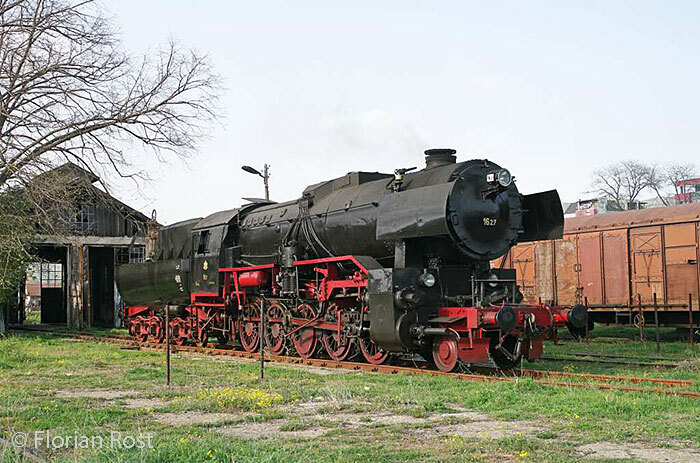 After the war, Fablok in Chrzanów (Krenau) in Poland delivered the missing locomotives between 1949 and 1950. One of them, 60976, is serviceable and will haul our charter trains. The line offers many nice views, semaphores signals and buildings. However, the partly parallel road has been modernised with crash barriers which spoil some of the positions. The climb is to the highest point of the network of BDŽ, Avramovo at 1,267 metres above the sea, and is mastered by several loops. The steepest section needs to be covered with a diesel helper. But photographically we’ll not miss anything as this section leads through dense and dark forest. These days the line is served by 1,300 bhp strong diesel locomotives. 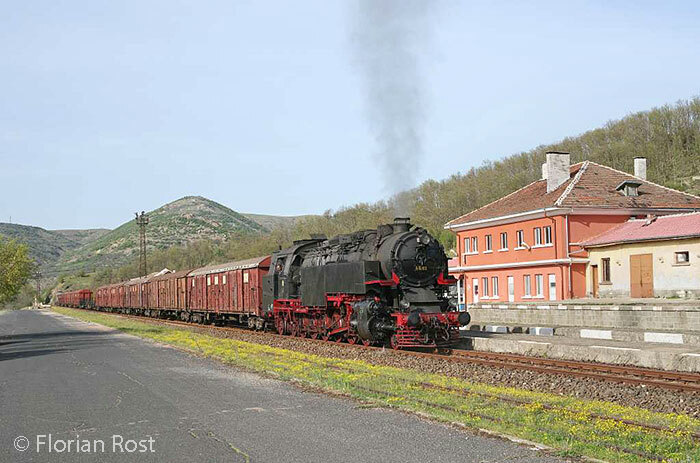 The few passenger trains which still run make us wonder why the BDŽ still sticks to this line. Between Radomir and Zemen there is not much worth photographing, but then the line sweeps into a scenic gorge. The vegetation along the line is a problem, as well as the limited space at some of the scenic spots. Our group needs to behave similar to the Lion’s Mouth in Sri Lanka, where everyone got his shot despite the limited available space. Beyond Kjustendil the line climbs in some scenic curves uphill before it disappears into dense forests. Before it becomes covered in dense vegetation, we’ll do some shots of the sunrise in this winding section. Some kilometres before we reach Gjueshevo, the line becomes more and more open and we’ll find a good number of photo opportunities. Close to its former area of operation on the main line, Sofia  Pernik, we’ll use the wonderful 46.03. It’s a very successful six-coupled design of 2-12-4 wheel arrangement. 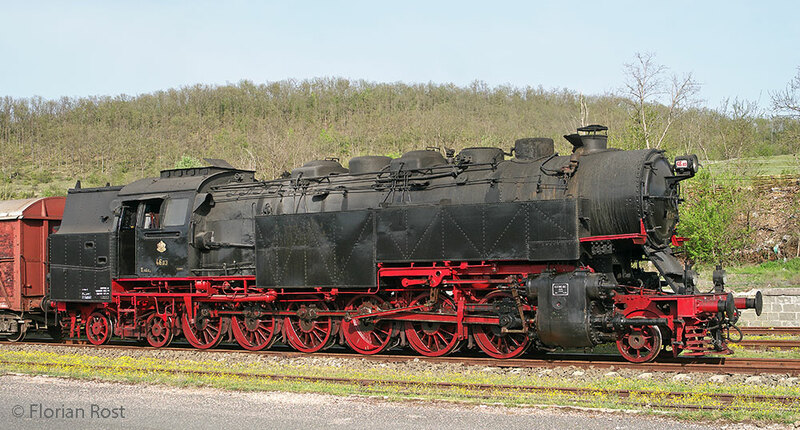 This two cylinder massive tank locomotive was delivered by Cegielski in Poznan (203/1936). 12 locomotives of this series (46.01  12) were built as a two cylinder design by Cegielski, and another eight (46.13  20) were designed as three cylinder locomotives by BMAG (formerly Schwartzkopff, manufacturer’s numbers 11794 to 11801). These millipedes have been and still are very impressive locomotives and, I’m sure, everyone who experiences this locomotive will be fascinated when it’s mastering the gradients. Over night we’ll transfer the locomotive via Sofia to the north, to make it available on another nice line further north. This line serves a mine in the mountains. It sees relatively dense traffic. The line is challenging, partly overgrown, but still very well worth the effort of going there. There are some remarkable photo positions which need a certain effort to climb the hills, but the magnificent class 46 is well worth all the effort. We’ll probably cover the line twice (one time in the morning and another time in the afternoon) to make the most of it. I must give the usual words of warning beforehand about the risks when you run a tour with steam locos involved in this age beyond steam. Take it as read when I say there might be problems. There may be failures and cancellations. No-one covers the full risk (and I’m not talking only about a loco failure) we’re incurring in offering this tour. Booked flights cannot be refunded free of charge and holidays you’ve booked cannot be compensated in the case that we have to cancel the tour. However, as we’re inside the European Union we expect to get at least a major part of our paid money back in the case that we can’t travel to Bulgaria. The railway lines in Bulgaria are often encased in bushes and copses and some of the possible photo locations can’t be offered because of this. Other positions might be too tight to be possible for the whole group. In any case it’s helpful to bring some gardening equipment with you. We’ll travel before the spring green covers everything, so we have a good chance to get some very good pictures from this tour. Delays are a problem which can occur at any time. The only timings for sure are the sunrise and the sunset: in Sofia 07.11 hrs and 19.52 hrs on March 31st. Our steam locomotives depend on a working water supply. This is always a big and sometimes unmanageable challenge for the state railways and requires much time … sometimes. You should expect that every small issue can be exaggerated into a big problem. Nowadays every idiot is able to handle his iPhone, but the number of people who are able to fill a bucket with water is shrinking. Bulgaria is a country of the European Union and member of the Shengen convention. Many nationals only need their ID card, please check on the Immigration website whether your nationality can travel to Bulgaria visa-free. The country can be rated as safe, but of course you should always use common sense. Occasionally meals will be provided as a packed meal. This is essential in order to make the most out of our time. We’ll not have any fixed times for meals, and sometimes a meal might be cancelled as well. Travelling to Bulgaria requires a European-wide valid health insurance. The three locomotives we’ll use on our tour are all unique engines which cannot be replaced in case of a failure. There is no insurance or anything else which can cover the risk of technical problems. On the narrow gauge line a technical problem with the loco will terminate this part of the tour while on the standard gauge we can substitute a failed locomotive. But the highest risk on this tour isn’t the locomotives which could fail. It’s the erratic behaviour of some state railway employees. From experience, we need to fear that the BDŽ will add substantial amounts to the bill. Hence a “margin call” or the cancellation of the tour shortly beforehand can’t be ruled out. There is no cure for the “BDŽ risk“ and everyone who books the tour should be aware of this. In the case of cancellation of parts of the programme, or of the whole tour, we can only pay back what we receive back from the Bulgarians. Changes in the itinerary are possible at any time. The tour is planned with the dedicated photographer and video filmmaker in mind. The itinerary is designed for those who think it more important to get the perfect shot and not necessarily to sample the local food, bars or nightclubs. We’ll mainly use middle class hotels which may have problems meeting central European standards. Please remember that accommodation, buses and the railway itself do not necessarily conform to standards you expect. Safety and environmental standards are still not fully developed, so a word of warning: Please beware of the dangers in and around the railway and other modes of transportation. An accident and health insurance policy covering foreign countries is absolutely essential. Neither FarRail Tours nor the local company who arranges everything on the ground, nor the railways themselves can be held responsible for any incidents, accidents, delays, changes in the itinerary, cancellations etc. Personal expenses such as telephone, hotel minibar, laundry service etc.